Back when I wrote about microwaving winter squash I mentioned that I really prefer it baked, but sometimes microwave to save time. Well, I had a nice little pie pumpkin that I wanted to cook – so I baked it. The natural moisture in the vegetable has a chance to evaporate in the oven, and it leaves a denser, sweeter vegetable. First – pumpkins. They are, in fact, a type of winter squash, and all winter squash can really all be substituted for each other in most recipes. There may be some change of taste or texture, but they will essentially work… At the same time, there are several kinds of pumpkin. The big ones grown for jack-o-lanterns are bred for size, not really taste. There’s not much solid flesh, for the size, and what there is is likely to be stringy and often watery. In fact, they’re bred so that carving a jack-o-lantern, letting it sit around for a week, and then throwing it out isn’t really wasting food… the plant was raised for this purpose. 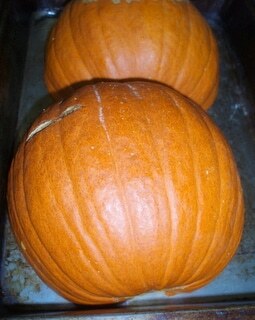 You certainly can eat them – but they are not the best choice as an eating pumpkin. 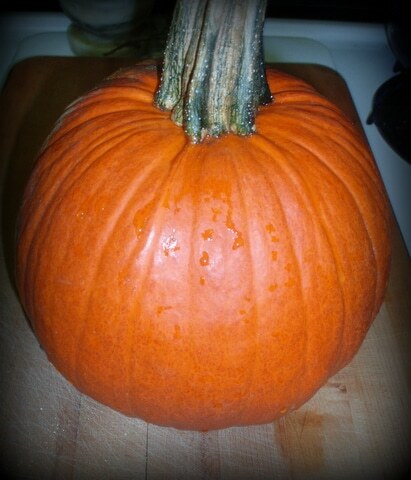 So, I had this pumpkin… First, we both took a lot of pictures of it – it’s the one in the picture with the blue teapot. Seemed just right for that! But then, of course, we wanted to eat it. The preparation is really the same as for the microwave. Cut it in half from top to bottom, and scoop out the insides. Yes, in a perfect world I would save the seeds, clean them out of the stringy stuff, and roast them. 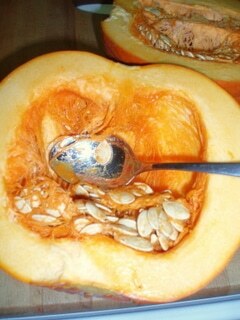 I didn’t have the energy, and we’re not that fond of pumpkin seeds… but please do so, if it sounds good to you. And if you have children who like gooey stuff – some do, some don’t – have them help you with the scooping. Many kids love a chance for permitted ickiness. Anyhow, after it is scooped out, I put the halves face down in a large baking pan (you may need more than one, depending on the size of your pumpkin.) I prefer to keep it in half, because it holds in the steam generated by the moist flesh, but if you need to cut it further to fit in a pan, that’s fine, it still works. I baked this at 350º for 20 minutes, then turned it over. (Carefully, with tongs – steam may escape…) At this point, if I were baking a small squash to eat in the shell – say, an acorn or carnival squash – I might add a dab of butter, and then, as it melted, brush it over the surface of the squash. Didn’t do that for the pumpkin… This took about another 20 minutes, and it was tender. The time will vary a bit by the squash – I’m sorry, I keep saying that, but it’s the way it works… They’re different sizes, they have different moisture content… As a rule of thumb, for a small squash I’d do 15 minutes on the first side, turn it and check after another 15. I do 20 minutes each side for a large one like this. After the second half, poke it with a knife – you want the knife to glide right in, with no resistance. If it still seems a bit firm, give it another 5 minutes and check again. In this case, we weren’t eating it right away, so I took it out and let it cool completely. (And didn’t take a picture… oops…) Then I scooped out the soft flesh and packed it into freezer containers. Labeled the containers, and, when they were completely cool, put them in the freezer. 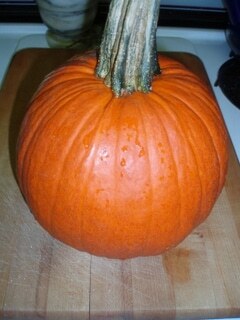 I’m planning a first course of Pumpkin Soup. 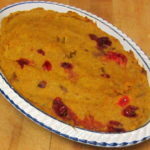 Which is simply the Squash Soup made with pumpkin, and using pumpkin pie spice instead of curry powder. I will use the precooked frozen onion, add chicken broth (or giblet broth, if I have enough, though that will probably be reserved for gravy) and the spice mix, and blend it with the tofu and pumpkin at some quiet moment before the turkey is ready. When it is out of the oven and resting, I’ll just heat the soup and serve it. The meal is going to be fairly simple. We may have one guest… but this year, three of us at most. 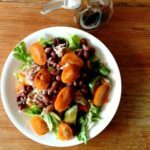 I will certainly have more dishes than I would for an everyday dinner – but not the groaning board I’d serve to an large extended family – or even the large group of friends I might invite if other aspects of my life were different. And everything is being planned for minimum stress on the day – I’ve never thought a harried hostess was a good addition to a festive meal.